The latest news from insider sources is that GM has placed the El Camino SS for possible production as a 2020 year model under the Chevrolet badge. The nomenclature will change simply to the Camino SS. Borrowing heavily from the new 7th Gen 2020 Camaro, the Camino, and Camino SS is said to offer a modern take on nostalgia (whatever that means) with vast technical, efficiency and performance advancements. Markets for the vehicle currently include North America, South America, Australia, and South Africa. No European model has been expressed even though marketing research is currently underway. The project is slated to offer a similar powertrain as the 2020 Camaro SS with a revamped LT4 (possible engine nameplate change) 6.2L base with regenerative power assist. Engineers are working to hit the mark of a sub 3.5 second 0-60 time for the 2020 Camino SS. Sources said that this would be a possibility with the 10-speed automatic, launch control and the optional performance package. 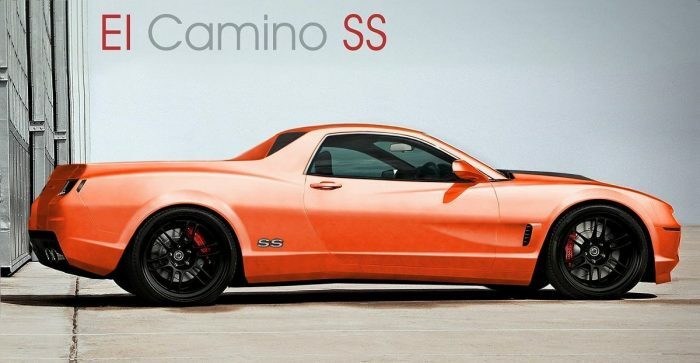 The 2020 Camino SS is said to offer up anywhere from 500 to 555 hp with torque figures currently unknown. Insiders said that the powerband will be smooth and predictable as the 2020 Camino SS will have low-end torque sourced from the kinetic energy system and will lessen as the engine builds boost from the Eaton supercharger. The 2020 Camino SS will offer a modified Magnetic Ride Control™ suspension system that our sources say will over unsurpassed control when coupled with StabiliTrak™. The Magnetic Ride Control™ will assist with varying towing and payload weights in order to maintain a “level and safe” ride height. Currently, we report that GM engineers have been working with their carbon fiber supplier Teijin to deliver a vast amount of carbon fiber products to help hit a target curb weight for the 2020 Camino SS at 2800 lbs. The 2020 Camino SS MPG rating has not been stated as the addition of a kinetic energy system will help overall improve efficiency. Even though the engineering team is working on a shared kinetic energy system for the Camaro and Camino lineup, sources said that these would be the first vehicles to lose the technology if efficiency and emissions standards are loosened under the current federal administration. Performance is said to be affected but will keep production costs lower.